China is the world's most populous country and has a rapidly growing economy, which has contributed to higher overall energy demand in China. China's real gross domestic product (GDP) grew at an estimated 10 percent in 2010, after registering an average growth rate of 10 percent between 2000 and 2009, according to the International Monetary Fund. China is the world's second largest oil consumer behind the United States, and the largest global energy consumer, according to the International Energy Agency (IEA). 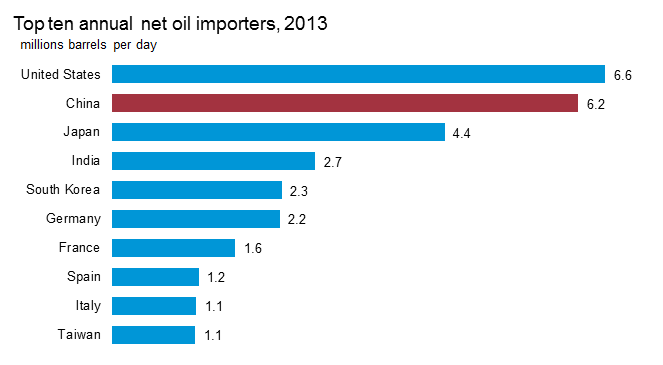 China was a net oil exporter until the early 1990s and became the world's second largest net importer of oil in 2009. 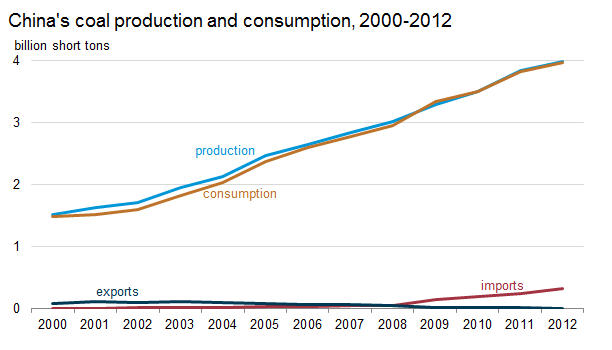 China's oil consumption growth accounted for over a third of the world's oil consumption growth in 2010. Natural gas usage in China has also increased rapidly in recent years, and China has looked to raise natural gas imports via pipeline and liquefied natural gas (LNG). China is also the world's largest producer and consumer of coal, accounting for almost half of the world's coal consumption, an important factor in world energy-related CO2 emissions. Coal supplied the vast majority (71 percent) of China's total energy consumption of 85 quadrillion British thermal units (Btu) in 2008. Oil is the second-largest source, accounting for 19 percent of the country's total energy consumption. While China has made an effort to diversify its energy supplies, hydroelectric sources (6 percent), natural gas (3 percent), nuclear power (1 percent), and other renewables (0.2 percent) account for relatively small shares of China's energy consumption mix. 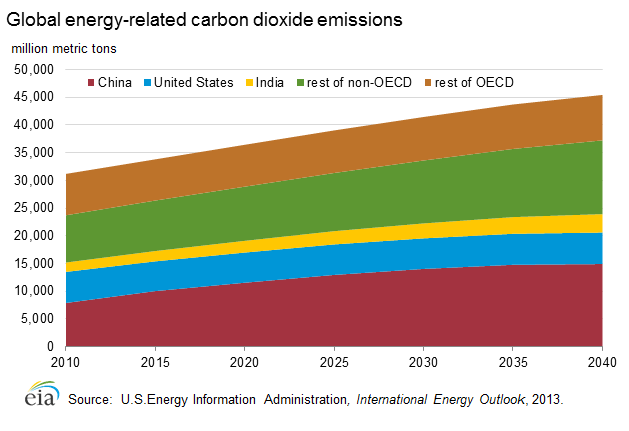 EIA projects coal's share of the total energy mix to fall to 62 percent by 2035 due to anticipated increased efficiencies and China's goal to reduce its carbon intensity (carbon emissions per unit of GDP). However, absolute coal consumption is expected to double over this period, reflecting the large growth in total energy consumption. According to Oil & Gas Journal (OGJ), China had 20.4 billion barrels of proven oil reserves as of January 2011, up over 4 billion barrels from two years ago. China's largest and oldest oil fields are located in the northeast region of the country. China produced an estimated 4.3 million bbl/d of total oil liquids in 2010, of which 96 percent was crude oil. China's oil production is forecast to rise by about 290 thousand bbl/d to over 4.5 million bbl/d in 2012. China consumed an estimated 9.2 million barrels per day (bbl/d) of oil in 2010, up nearly 900 thousand bbl/d, or over 10 percent from year-earlier levels. China's net oil imports reached about 4.8 million bbl/d in 2010 and it became the second-largest net oil importer in the world behind the United States in 2009. 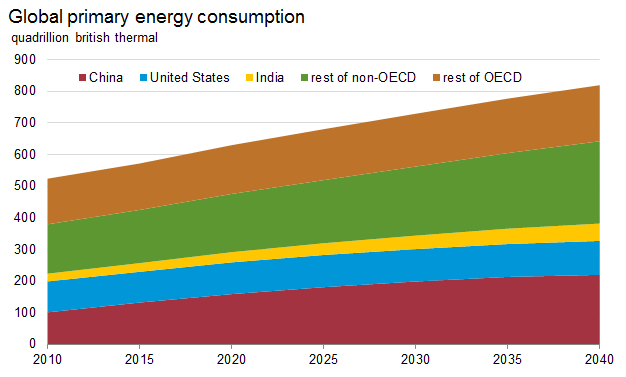 EIA forecasts that China's oil consumption will continue to grow during 2011 and 2012, and the anticipated growth of 1.1 million bbl/d between 2010 and 2012 would represent almost 40 percent of projected world oil demand growth during the 2-year period. The Chinese government's energy policies are dominated by the country's growing demand for oil and its reliance on oil imports. The National Development and Reform Commission (NDRC) is the primary policymaking and regulatory authority in the energy sector, while four other ministries oversee various components of the country's oil policy. The government launched the National Energy Administration (NEA) in July 2008 in order to act as the key energy regulator for the country. The NEA, linked with the NDRC, is charged with approving new energy projects in China, setting domestic wholesale energy prices, and implementing the central government's energy policies, among other duties. The NDRC is a department of China's State Council, the highest organ of executive power in the country. In January 2010, the government formed a National Energy Commission with the purpose of consolidating energy policy among the various agencies under the State Council. China's national oil companies (NOCs) wield a significant amount of influence in China's oil sector. Between 1994 and 1998, the Chinese government reorganized most state-owned oil and gas assets into two vertically integrated firms: the China National Petroleum Corporation (CNPC) and the China Petroleum and Chemical Corporation (Sinopec). These two conglomerates operate a range of local subsidiaries, and together dominate China's upstream and downstream oil markets. CNPC is the leading upstream player in China and, along with its publicly-listed arm PetroChina, account for roughly 60 percent and 80 percent of China's total oil and gas output, respectively. CNPC's current strategy is to integrate its sectors and capture more downstream market share. Sinopec, on the other hand, has traditionally focused on downstream activities, such as refining and distribution, with these sectors making up nearly 80 percent of the company's revenues in recent years and is gradually seeking to acquire more upstream assets. Additional state-owned oil firms have emerged over the last several years. The China National Offshore Oil Corporation (CNOOC), which is responsible for offshore oil exploration and production, has seen its role expand as a result of growing attention to offshore zones. Also, the company has proven to be a growing competitor to CNPC and Sinopec by not only increasing its exploration and production (E&P) expenditures in the South China Sea but also extending its reach into the downstream sector particularly in the southern Guangdong Province. The Sinochem Corporation and CITIC Group have also expanded their presence in China's oil sector, although they are still relatively small. Whereas onshore oil production in China is mostly limited to CNPC and CNOOC, international oil companies (IOCs) have been granted greater access to offshore oil prospects, mainly through production sharing agreements. IOCs involved in offshore E&P work in China include: Conoco Phillips, Shell, Chevron, BP, Husky, Anadarko, and Eni, among others. IOCs leverage their technical expertise in order to partner with a Chinese NOC and make a foray into the Chinese markets. The Chinese government launched a fuel tax and reform of the country's product pricing mechanism in December 2008 in order to tie retail oil product prices more closely to international crude oil markets, attract downstream investment, ensure profit margins for refiners, and reduce energy intensity caused by distortions in the market pricing. When international crude oil prices increased in 2010, the NDRC did not increase downstream fuel prices at the same level, causing refiners, especially NOCs to incur profit losses on the downstream business and increase exports to help offset the losses. China's total oil production reached 4.3 million bbl/d in 2010, increasing 0.28 million bbl/d from 2009. This was primarily due to new offshore production growth. CNPC's Daqing field, located in the Northeast, produced about 797,000 bbl/d of crude oil in 2010, according to FACTS Global Energy's most recent estimate. Sinopec's Shengli oil field in the Bohai Bay produced about 547,000 bbl/d of crude oil during 2010, making it China's second-largest oil field. However, Daqing, Shengli, and other ageing fields have been heavily tapped since the 1960s, and output is expected to decline significantly in the coming years. Recent exploration and production (E&P) activity has focused on the offshore areas of Bohai Bay and the South China Sea (SCS), as well as onshore oil and natural gas fields in western interior provinces such as Xinjiang, Sichuan, Gansu, and Inner Mongolia. Roughly 85 percent of Chinese oil production capacity is located onshore, primarily in mature fields. Although offshore E&P activities have increased substantially in recent years, China's interior provinces, particularly in the northwest's Xinjiang Province, have also received significant attention. Recently, China announced its plan to make Xinjiang into the country's largest oil and gas production and storage base. The onshore Junggar, Turpan-Hami, and Ordos Basins have all been the site of increasing E&P work, although the Tarim Basin in northwestern China's Xinjiang Uygur Autonomous Region has been the main focus of new onshore oil prospects. IHS estimated reserves to be 290 million barrels in 2009. Crude oil production from Tarim reached 111,000 bbl/d in 2010 according to FACTS Global Energy, and only 12 percent of the basin has been explored. PetroChina envisages boosting production in the Junggar Basin, one of Xinjiang's oldest basins, from 250,000 bbl/d in 2008 to 328,000 bbl/d by 2015. China's NOCs are also investing to increase oil recovery rates at the country's mature oil fields. CNPC is increasingly utilizing associated natural gas supplies from the Daqing field for reinjection purposes to fuel enhanced oil recovery (EOR) projects. CNPC hopes that EOR techniques can help stabilize Daqing's oil output in the years ahead. However, China's domestic demand for natural gas supplies is also increasing, which may put a competing claim on natural gas supplies from Daqing. 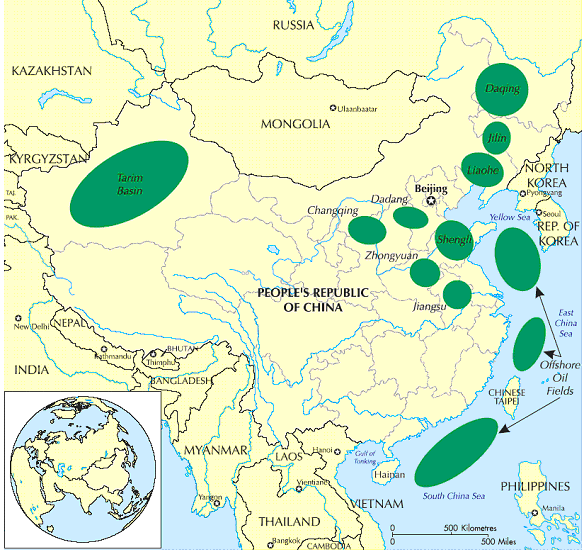 The map below delineates the location of some of the major Chinese oil basins. About 15 percent of overall Chinese oil production is from offshore reserves, and most of China's oil production growth likely will come from offshore fields. Offshore E&P activities have focused on the Bohai Bay region, the South China Sea (particularly the Pearl River Basin), and, to a lesser extent, the East China Sea. The Bohai Bay Basin, located in northeastern China offshore Beijing, is the oldest oil-producing offshore zone and holds the bulk of proven offshore reserves in China. PetroChina initiated phase one development of the Nanpu field in June 2007, and hopes to bring 200,000 bbl/d of crude oil production on-stream by 2012. CNOOC intends to double oil production in the offshore Bohai Bay, where over half of the NOC's production is expected to originate by 2015. The NOC made 8 new discoveries in the Bohai Bay in 2009 and brought several fields online including Jinhzhou and Bonzhong. CNOOC's production in the Bohai Bay including volumes from the East China Sea was 317,000 bbl/d in 2009. In 2009, CNOOC's total oil production in the SCS was 191,000 bbl/d. According to PFC Energy, CNOOC's proven hydrocarbon (oil and gas) reserves in 2009 in the SCS were 957 million barrels of oil equivalent, up 28 percent from a decade ago. CNOOC and ConocoPhillips are developing the Panyu oilfields with output peaking at 60,000 bbl/d. In 2010, CNOOC made another significant discovery of the Enping Trough in the shallow waters of the SCS, which could generate up to 30,000 bbl/d. CNOOC tendered 13 blocks in May 2010 in the South China Sea. Territorial disputes in the East China Sea have so far limited large-scale development of fields in the region, where China and Japan's Exclusive Economic Zones (EEZs). The two countries have held negotiations to resolve the disputes. In June 2008, the two countries reached an agreement to jointly develop the Chunxiao/Shirakaba and Longjing/Asurao fields. However, in early 2009, the agreement unraveled when China asserted sovereignty over the fields. Tensions in the second half of 2010 have surfaced between the two countries over the gas fields. China claims ownership of the potentially hydrocarbon rich Spratly Islands in the South China Sea, as do the Philippines, Malaysia, Taiwan, and Vietnam. In June 2007, BP abandoned plans to conduct exploration activities near the Spratly Islands, citing ongoing uncertainty over competing ownership claims between China and Vietnam. The Paracel Islands, which China first occupied in 1974, are also claimed by Vietnam. China's overseas equity oil production grew significantly this decade from 140,000 bbl/d in 2000 to 1.2 million bbl/d in 2009. With China's increasing dependence on oil imports and the need for diversification of energy supply sources, Chinese NOCs have sought interests in projects overseas. CNPC has been the most active company, while Sinopec, CNOOC, and other smaller NOCs have also expanded their overseas investment profile. CNPC held hydrocarbon assets in 29 countries by the end of 2010 and 684,000 bbl/d of overseas oil equity production. China is taking advantage of the economic downturn and lower asset values to step up its global acquisitions. Since 2009, the NOCs have purchased assets in the Middle East, Canada, and Latin America, with about $28 billion invested for direct acquisition of oil and gas assets from other companies. Chinese NOCs have secured bilateral oil-for-loan deals amounting to over $90 billion with several countries. CNPC plans to expand overseas production to 4 million bbl/d by 2020. China can use its vast foreign exchange reserves, estimated at $2 trillion, to help leverage investments. China finalized oil-for-loan deals recently with Russia, Kazakhstan, Venezuela, Brazil, Ecuador, Bolivia, Angola, and Ghana and a gas-for-loan agreement with Turkmenistan. The Middle East remains the largest source of China's crude oil imports, although African countries also contribute a significant amount. 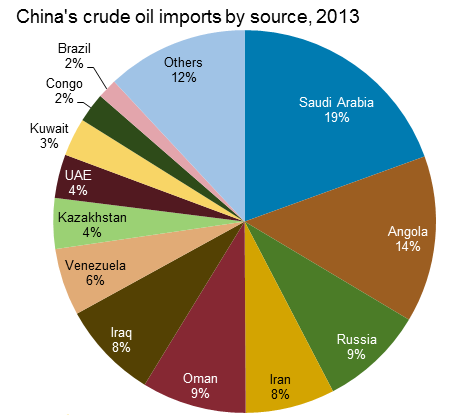 China imported nearly 4.8 million bbl/d of crude oil in 2010, of which over 2.2 million bbl/d (47 percent) came from the Middle East, 1.5 million bbl/d (30 percent) from Africa, 176,000 bbl/d (4 percent) from the Asia-Pacific region, and 938,000 bbl/d (20 percent) came from other countries. In 2010, Saudi Arabia and Angola were China's two largest sources of oil imports, together accounting for over one-third of China's total crude oil imports. Crude oil imports rose over 17 percent from 4.1 million bbl/d in 2009. Angola has become as significant an exporter of crude to China as Saudi Arabia and in some months has been the largest supplier. The EIA expects China to import about 72 percent of its crude oil by 2035, a significant rise from the current 50 percent. China has actively sought to improve the integration of the country's domestic oil pipeline network, as well as to establish international oil pipeline connections with neighboring countries to diversify oil import routes. In March 2007, CNPC spearheaded the Beijing Oil & Gas Pipeline Control Center that monitors all long-distance pipelines. According to the CNPC, China has about 13,932 miles of total crude oil pipelines (70 percent managed by CNPC) and nearly 8,265 miles of oil products pipelines in its domestic network. At present, the bulk of China's oil pipeline infrastructure serves the more industrialized coastal markets. However, several long-distance pipeline links have been built or are under construction to deliver oil supplies from newer oil-producing regions or from downstream centers to more remote markets. The 1,150-mile Western China Refined Oil Pipeline delivers petroleum products from Urumqi in Xinjiang Province to Lanzhou in Gansu Province. Gradually, this pipeline will connect with other regional spurs to deliver supplies to the coastal regions, as well as accommodate additional oil imports from Kazakhstan. Previously, most oil supplies from Xinjiang were delivered by rail. In addition, the Western Pipeline consists of a crude oil line travelling from Xinjiang to the Lanzhou refinery. CNPC has commissioned various oil product pipelines. The company launched the Lanzhou-Chengdu-Chongqing pipeline in 2008 and the 300,000 bbl/d Lanzhou-Zhengzhou-Changsha pipeline in 2009. PetroChina also has plans to build at least two additional spurs from Zhengzhou, which would help deliver crude oil supplies eastward. One is the Zhengzhou-Jinzhou pipeline, which would deliver oil northeastward to Hubei Province. The other is the Zhengzhou-Changsha link, which would terminate in Hunan Province near the industrial southeast. China inaugurated its first transnational oil pipeline in May 2006, when it began receiving Kazakh and Russian oil from a pipeline originating in Kazakhstan. The 200,000 bbl/d pipeline spans 620 miles, connecting Atasu in northern Kazakhstan with Alashankou on the Chinese border in Xinjiang. The pipeline was developed by the Sino-Kazakh Pipeline Company, a joint venture between CNPC and Kazakhstan's KazMunaiGaz (KMG). The pipeline's third leg from Kenkiyak to Atasu and an expansion of the entire pipeline, doubling capacity to 400,000 bbl/d, are to be completed in 2011 by CNPC. Industry publications suggest that the Atasu to Alashankou line has been running at about 50 percent of capacity, or slightly over 100,000 bbl/d. Russia's Far East has become another source for Chinese crude oil imports. Russian state-owned oil giant Transneft began construction in April 2006 on a pipeline that will extend 2,972 miles, from the Russian city of Taishet to the Pacific Coast. Known as the Eastern Siberia-Pacific Ocean Pipeline (ESPO), the project will be completed in two stages. The first stage of the project includes the construction of a 600,000 bbl/d pipeline from Taishet to Skovorodino. The first phase of ESPO, which became operational in January 2011, is scheduled to deliver 300,000 bbl/d to the Chinese border. Furthermore, CNPC intends to build a 597-mile pipeline linking the spur with the Daqing oil field in the Northeast. China has also revived its plans to construct an oil import pipeline from Myanmar through an agreement signed in March 2009. As Myanmar is not a significant oil producer, the pipeline is envisioned as an alternative transport route for crude oil from the Middle East and Africa that would bypass the potential choke point of the Strait of Malacca. Initial capacity for the pipeline is slated to be 244,000 bbl/d, ramping up to 400,000 bbl/d. China is steadily increasing its oil refining capacity in order to meet robust demand growth. Most industry sources estimate China's installed crude refining capacity at over 11 million bbl/d. China's goal is to augment refining capacity by about 3.3 million bbl/d by 2015. A recent report by Sinopec stated that the national oil refining capacity would rise to 15 million bbl/d by 2016. Sinopec and CNPC are the two dominant players in China's oil refining sector, accounting for 50 percent and 35 percent of the capacity, respectively. However, CNOOC entered the downstream sector through the commission of the company's first refinery, the 240,000 bbl/d Huizhou plant. Sinochem has also proposed a number of new refineries, and national oil companies from Kuwait, Saudi Arabia, Russia, Qatar, and Venezuela have also entered into joint-ventures with Chinese companies to build new refining facilities. The Chinese NOCs recently expanded their refining portfolios through commissioning two more refineries in 2010, Sinopec's Tianjin and CNPC's Quinzhou, each with a capacity of 200,000 bbl/d. By 2010, China's total refinery processing reached around 8.5 million bbl/d, up by 13 percent over the previous year. PetroChina (CNPC) is branching out to acquire refinery stakes in other countries in efforts to move downstream and secure more global trading and arbitrage opportunities. The company's purchase of Singapore Petroleum Corporation and a portion of Japan's Osaka refinery are cases where PetroChina is looking for a foothold within the region's refining opportunities. The refining sector has undergone modernization and consolidation in recent years, with dozens of small refineries (“teapots” and independent refiners), ranging from 40,000 bbl/d to 120,000 bbl/d and accounting for about 15 percent of total refinery capacity, shut down. The NDRC plans to eliminate refineries smaller than 20,000 bbl/d that are mostly owned by independent companies in efforts to encourage economies of scale and energy efficiency measures. Domestic price regulations for finished petroleum products have hurt Chinese refiners, particularly small ones, in the past few years when oil prices were high. Lower domestic prices compared to international market prices for retail products provides incentives for Chinese refiners, especially those run by national companies, to export high volumes of products. In 2010, China imported approximately 700,000 bbl/d and exported 600,000 bbl/d of petroleum products including LPG, gasoline, diesel, jet fuel, fuel oil, and lubricants. Exports of products are expected to remain high as refining capacity is added in 2011 and beyond. As China diversifies its crude oil import sources and expands oil production domestically, state-owned refiners will have to adjust to the changing crude slate. Traditionally, many of China's refineries were built to handle relatively light and sweet crude oils. In recent years, refiners have built or upgraded facilities to support greater Middle Eastern crude oil imports, which tend to be heavy and sour. Much of the country's planned new oil production in the offshore Bohai Bay is considered high-acid, and China is the largest importer of Sudan's Dar Blend, a high-acid crude. High-acid crude oil tends to be light and sweet, but refiners must install stainless steel metallurgy or utilize other advanced processes to successfully run the crude streams. In China's 10th 5-Year Plan (2000-2005), launched in 2001, Chinese officials decided to establish a government-administered strategic oil reserve program to help shield China from potential oil supply disruptions. This system will be built in three stages, and in 2004, China started construction at four sites that would comprise the first phase of the country's strategic oil reserve program. Phase 1 has a total storage capacity of 103 million barrels at four sites, and was completed in early 2009. Phase 1 storage capacity will amount to approximately 25 days of net oil imports based on 2008 estimates of Chinese oil demand. Thereafter, Phase 2, recently under construction for 8 sites, is expected to more than double capacity to 270 million barrels by 2012/13. Phase 3 is ultimately expected to bring total strategic oil reserve capacity in China to about 500 million barrels by 2016. In addition to the strategic reserves of crude oil, China has approximately 300 million barrels of commercial crude oil storage capacity according to some industry sources. The goverment reported that it also plans to create a strategic refined oil stockpile, to be operated by a subsidiary of NDRC, of 80 million barrels. According to OGJ, China had 107 trillion cubic feet (Tcf) of proven natural gas reserves as of January 2011, 27 Tcf higher than reserves estimated in 2009. China's production and demand for natural gas has risen substantially. In 2009, China produced 2.93 Tcf of natural gas, up around 8 percent from 2008, while the country consumed 3.08 Tcf. 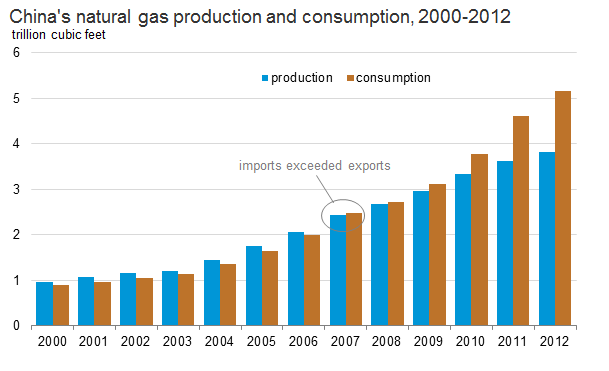 China became a net natural gas importer for the first time in almost two decades in 2007. The Chinese government anticipates boosting the share of natural gas as part of total energy consumption to 10 percent by 2020 to alleviate high pollution from the country's heavy coal use. Consumption for 2009 rose from 2008 levels by over 12 percent, and the country imported over 140 Bcf of liquefied natural gas (LNG) to fill the gap. Although a majority of the gas consumption is dominated by industrial users (45 percent in 2007 according to the National Bureau of Statistics), the recent growth of gas consumption in the past few years stems from the power, utilities, and residential sectors. EIA projects gas demand to more than triple by 2035, growing about 5 percent per year. To meet this anticipated shortfall, China is expected to continue importing natural gas via LNG and a number of potential import pipelines from neighboring countries. As with oil, the natural gas sector is dominated by the three principal state-owned oil and gas companies: CNPC, Sinopec, and CNOOC. CNPC is the country's largest natural gas company in both the upstream and downstream sectors. CNPC data shows that the company accounts for roughly 80 percent of China's total natural gas output. Sinopec operates the Puguang natural gas field in Sichuan Province, one of China's most promising upstream assets. CNOOC led the development of China's first three LNG import terminals at Shenzhen, Fujian, and Shanghai and manages much of the country's offshore production. CNOOC typically uses PSC agreements with foreign companies wanting to co-develop upstream offshore projects and has the right to acquire up to a 51 percent working interest in all offshore discoveries once the IOC recovers its development costs. China's natural gas prices, similar to retail oil prices are regulated and generally well below international market rates. China has favored manufacturing and fertilizer gas users by the relatively lower price these sectors pay. In order to bolster investment in the sector, particularly by foreign participants, and make domestic gas competitive with other fuels, the NDRC proposed linking gas prices indirectly to international crude oil prices, effectively raising prices. Industry analysts claim these price modifications are necessary to develop the gas market further. In mid-2010, the NDRC raised the onshore wellhead prices by 25 percent, and some Chinese cities have raised end-user prices in the industrial and power sectors. 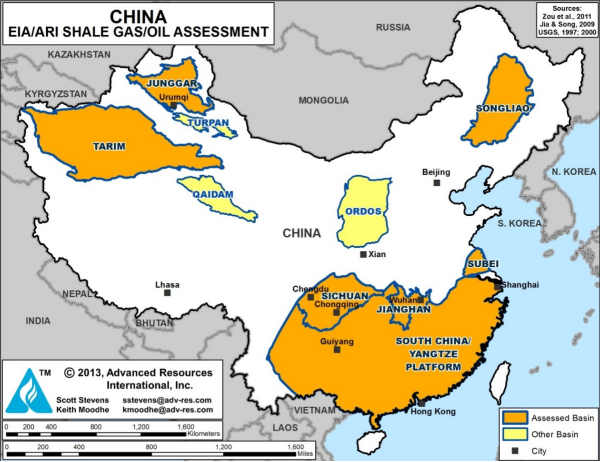 China's primary natural gas-producing regions are Sichuan Province in the southwest (Sichuan Basin); the Xinjiang Uygur Autonomous Region and Qinghai in the northwest (Tarim, Junggar, and Qaidam Basins); and Shanxi Province in the north (Ordos Basin), producing about 65 percent of China's total gas output. Several offshore natural gas fields are located in the Bohai Basin and the Panyu complex in the South China Sea. The largest recent discoveries in the southwestern region are Sinopec's find at the Yuanba and Puguang fields in Sichuan Province. Sinopec started commercial production at Puguang in early 2010 and anticipates the field peaking at 425 Bcf/y. Sichuan Province also holds the high sulfur content fields at the Chuandongbei basin. In 2007, CNPC awarded a 30-year production sharing contract (PSC) to Chevron to bring this technically challenging field online by 2013, with an eventual maximum production rate of 558 Bcf/y. Xinjiang is currently China's largest gas producing province, with output of 850 Bcf in 2009. According to IHS Global Insight, major fields in the Tarim Basin have proven gas reserves of nearly 20 Tcf, and only 12 percent of the basin has been explored thus far. However, the basin's complex geological features and the distance from China's main consumption centers make development costs relatively high. PetroChina's cross-country West-East Gas Pipeline, which spans 2,500 miles from the Xinjiang Uygur Autonomous Region to Shanghai, has greatly expanded the upstream potential of the TarimBasin to supply markets in eastern China. Tarim was the second largest gas-producing area in China in 2009, with 640 Bcf/y or 22 percent of China's total production, and PetroChina endeavors to increase production in order to feed the first West to East pipeline. The NOC is currently developing the Kela-2 field, China's largest gas field, which feeds gas to the first West to East Pipeline and has a maximum production capacity of 400 Bcf/y. Other new discoveries in the Northwest that have high potential of gas supply are the Junggar Basin in Xinjiang Province and the Qaidam Basin in Qinghai Province. The Chanqing oil and gas province in the Ordos basin was one of the largest producing gas region in China in 2009. Development of this region is geologically and technically challenging, though production has risen steadily this decade to 670 Bcf/y in 2009. PetroChina anticipates producing 1,230 Bcf/y in the region by 2015. Offshore zones have also received increasing attention for upstream natural gas developments in China. The South China Sea is home to the Yacheng 13-1 field, China's largest offshore natural gas field and a primary source of energy for Hong Kong's power stations. The Yacheng 13-1 field is operated by BP (34 percent), with CNOOC (51 percent) and Kuwait Foreign Petroleum Exploration Company (15 percent), and produces about 124 Bcf/y of natural gas. The Panyu 30-1 field was brought on in 2009 and is expected to peak at 58 Bcf/y. Sinopec also began exploring deepwater wells in the Qiongdongnan Basin in 2009 and partnered with Statoil to leverage their technical expertise in deepwater drilling. China's potential wealth of unconventional gas resources such as coal bed methane (CBM) and shale gas has spurred the government to seek foreign investors with technical expertise to exploit these reserves. China is estimated to have 6 Tcf so far of proven reserves from CBM in 2010, though estimates for recoverable reserves are much higher. Most of China's CBM volumes are from the north and northeastern basins and the Junggar basin in Xinjiang. FACTS Global Energy estimates that total CBM production in 2009 was 254 Bcf/y, and expects production to rise to 1,715 Bcf/d by 2030. Also, China's first long distance CBM pipeline became operational in late 2009, linking the Qinshui Basin with the West-East pipeline. Most of China's shale gas resources reside in the Sichuan and Tarim basins in the southern and western regions and in the northeast basins. In early 2010, the Ministry of Land Resources set out its goals regarding shale gas: to produce 530 to 1,000 Bcf/y, accounting for 8 to 12 percent of China's total natural gas from shale gas by 2020. EIA estimates that China's technically recoverable shale gas resources are 1,275 Tcf. China's NOCs are in discussion with several IOCs for partnering on potential shale gas projects. China had nearly 21,000 miles of natural gas pipelines with a capacity of 3.5 Tcf at the end of 2009. China's natural gas pipeline network is fragmented, though the government is investing in integrating local gas distribution networks, and plans to construct 14,400 miles of new pipelines between 2009 and 2015. While the major NOCs operate the trunk pipelines, local transmission networks are operated by various local distribution companies throughout China. This has prevented the emergence of a national gas transmission grid. CNPC moved into the downstream gas sector recently through investments in gas retail projects in 14 provinces, as well as investments in several pipeline projects. This will facilitate domestic gas transportation and increase gas imports for a growing market. Sinopec is also a major player in the downstream transmission sector, operating pipelines in the Sichuan province. Recently, the NOC commissioned the 1,000 mile, 425 Bcf/y pipeline running across 8 provinces from its recently operating Puguang field to Shanghai. PetroChina's West-East Gas Pipeline, commissioned in 2004, is China's single-largest natural gas pipeline at 2,500 miles in length. 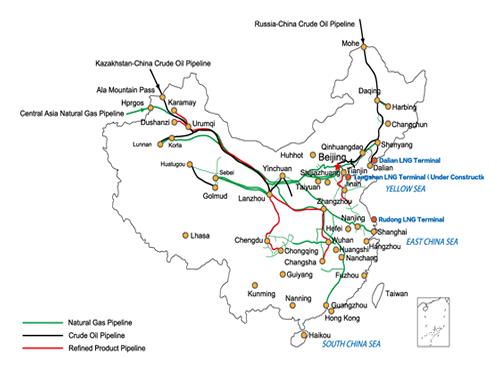 The pipeline links major natural gas supply bases in western China (Tarim, Qaidam, and Ordos Basins) with markets in the eastern part of the country. The Chinese government promoted the construction of the West-East Gas Pipeline to supply natural gas consumption to the eastern and southern regions of the country. The West-East pipeline has an annual capacity of 424 Bcf/y, capable of expansion to 600 Bcf/y, and contains numerous regional spurs along the main route, which has improved the interconnectivity of China's natural gas transport network. CNPC is building a second West-to-East trunk pipeline with a potential capacity of 1.1 Tcf/y. The eastern section of the line would run from the Sino-Kazakh border to Guangzhou in Guangdong Province, spanning more than 4,000 miles, and is due to be operational by 2012. The western section of the line became operational at the end of 2009 and will serve the markets of Shanghai once the eastern section is complete. In order to accommodate greater gas flows from Central Asia, CNPC released plans to construct the third West-East Pipeline to partially run parallel to the second West-East line and end in the southern province of Guizhou. Analysts anticipate that the 0.7 to 1 Tcf/y pipeline will offtake gas from Turkmenistan's production and domestic output from the Junggar fields, though supply arrangements are still undefined. There have been proposals for a fourth and fifth West-East pipelines which are in pre-feasibility stages. The Tarim Basin is reportedly slated to feed gas to the fourth line. China's first import natural gas pipeline was the Central Asian Gas Pipeline (CAGP), which spans 1,130 miles and bring natural gas imports to China from Turkmenistan, Uzbekistan, and Kazakhstan. In December 2009, CNPC was awarded a PSC to develop natural gas resources at Turkmenistan's large South Yolotan gas fields, and signed a deal with Turkmengaz, the state-owned gas company, to import natural gas supplies. The pipeline began operations in December 2009 with initial volumes at 200 Bcf/y, and links to the second West-East pipeline in China. Turkmenistan announced that it intends to raise the gas supply to at least 1.4 Tcf/y once the South Yolotan field development is complete in 2012. In June 2010, CNPC signed an MOU with Uzbekistan to deliver over 350 Bcf/y through a transmission line that would connect with the CAGP. Kazakhstan and China also signed a joint venture agreement in June 2010 to jointly construct the second phase of the Kazakh-China gas pipeline, starting in western Kazakhstan and linking to the CAGP. Pipeline commissioning could begin in 2012. There are several proposed pipelines that could contribute to Chinese natural gas imports in the future. • In March 2006, CNPC officials signed a Memorandum of Understanding with Russia's Gazprom for two pipeline proposals, one from Russia's western Kovykta gas field to northwestern China with a pipeline capacity between 1 and 1.4 Tcf/y by 2015. A second proposed route, called the Eastern pipeline, would connect Russia's Far East and Sakhalin Island to northeastern China, and would have 1.1 to 1.4 Tcf/y capacity. • CNPC signed a deal with Myanmar in March 2009 to finance the construction of a 1,123-mile, 420 Bcf/y pipeline from two of Myanmar's offshore blocks to Kunming, China. Construction began on the project, due to commence in 2013. 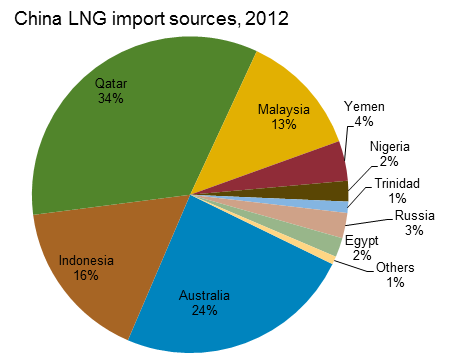 China's natural gas imports are primarily in the form of LNG. 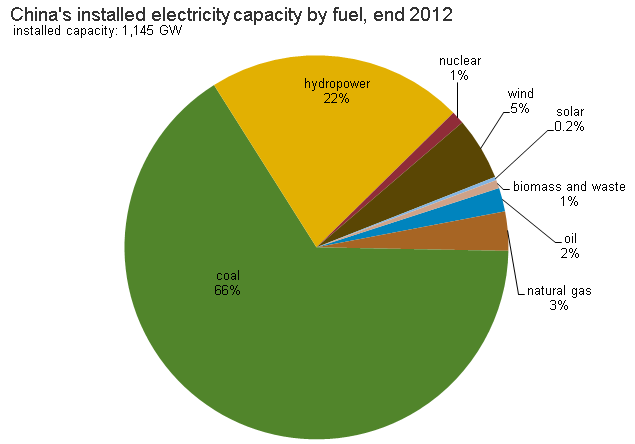 Re-gasification capacity was over 584 Bcf in 2010. China's LNG imports are expected to rise as more terminal capacity comes online, though higher international LNG prices versus lower gas prices from domestic sources and Turkmenistan could cause more competition for LNG. China imported its first shipment of LNG in the summer 2006, and the country has quickly ramped up imports since then, importing about 730 MMcf/d in 2009 and 1,200 MMcf/d in 2010. LNG now enters the country through three terminals, with another five under construction and more receiving government approvals. CNOOC is the key LNG player in China and operates all three existing plants. Chinese NOCs must secure supply prior to gaining government approval to build a re-gasification terminal, and Chinese firms are faced with competition from other regional buyers, mainly in Korea and Japan. Therefore, CNOOC and PetroChina have signed several long terms supply contracts totaling about 3 Bcf/d. These contracts are primarily with Asian firms sourcing LNG from Indonesia, Malaysia, and Australia. Several re-gasification terminals are in various phases of planning and construction. CNOOC is keenly interested in growing its LNG market as it has a competitive advantage thus far in the sector compared to the other NOCs. In addition, CNOOC received approval to build its planned Zhejiang plant from the NDRC in 2009, and intends to expand the company's three existing terminals. PetroChina entered the LNG market and is currently building the Dalian, Jiangsu, and Tangshan re-gasification terminals. China is the largest producer and consumer of coal in the world, and accounts for almost half of the world's coal consumption. According to the World Energy Council, China held an estimated 114.5 billion short tons of recoverable coal reserves in 2009, the third-largest in the world behind the United States and Russia, and equivalent to about 14 percent of the world's total reserves. Coal production rose to almost 3.4 billion short tons in 2009, making China the largest coal producer in the world. There are 27 provinces in China that produce coal, and slightly greater than half of China's coal is used for power generation. Northern China, especially the Shanxi and Inner Mongolia Provinces, contains most of China's easily accessible coal and virtually all of the large state-owned mines. Coal makes up 71 percent of China's total primary energy consumption, and in 2009, China consumed an estimated 3.5 billion short tons of coal, representing over 46 percent of the world total and a 180 percent increase since 2000. 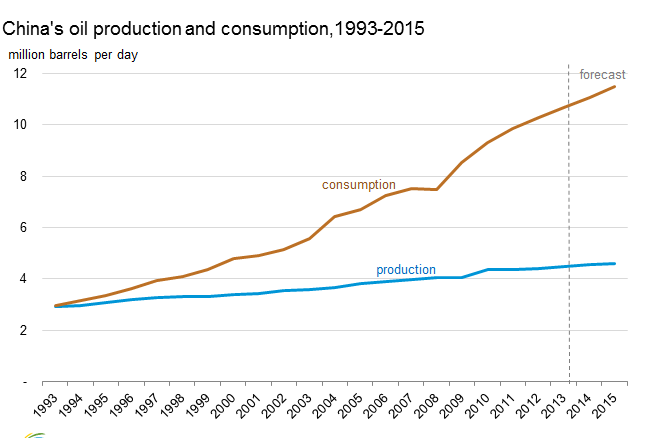 Coal consumption has been on the rise in China over the last nine years, reversing the decline seen from 1996 to 2000. China's coal imports started growing after 2002 because the cost of importing coal became competitive with domestic production. China, typically a net coal exporter, became a net coal importer in 2009, importing from Indonesia, Australia, Vietnam, and Russia. In September 2009, the China Coal Transportation and Distribution Association stated that China signed a $6 billion loan-for-coal agreement with Russia for 15 to 20 million tons of coal for 25 years. China's coal industry has traditionally been fragmented among large state-owned coal mines, local state-owned coal mines, and thousands of town and village coal mines. The top three state-owned coal companies produce less than 15 percent of the domestic coal. Shenhua Coal, the world's largest coal company, holds 9 percent of the domestic market in China. China has tens of thousands of small local coal mines where insufficient investment, outdated equipment, and poor safety records prevent the full utilization of coal resources. Though the smaller coal mines currently hold a sizeable portion of the market, they are inefficient and are ineffective in responding to market demand. The goal of consolidating the industry is to raise total coal output, attract greater investment and new coal technologies, and improve the safety and environmental record of coal mines. As part of China's 12th Five-Year Plan, the government intends to consolidate the sector. The State Council also began promoting cross-business ventures and participation between power, industrial and coal companies in order to facilitate the coal sector consolidation process in 2009. In contrast to the past, China is becoming increasingly open to foreign investment in the coal sector in an effort to modernize existing large-scale mines and introduce new technologies into China's coal industry. The China National Coal Import and Export Corporation is the primary Chinese partner for foreign investors in the coal sector. Areas of interest in foreign investment include coal liquefaction, CBM production, coal-to-gas and slurry pipeline transportation projects. The Chinese government is actively promoting the development of a large coal-to-liquids industry. A Shenhua Group subsidiary commissioned the country's first coal-to-liquids plant in 2009. The facility is located in the Inner Mongolia Autonomous Region and has an initial capacity of approximately 24,000 bbl/d of diesel, ramping up to 240,000 bbl/d by 2015. Shenhua Group and Sasol Limited began construction on a second CTL project, Ningxia CTL, in 2010, and expects to commission 80,000 bbl/d by 2017. 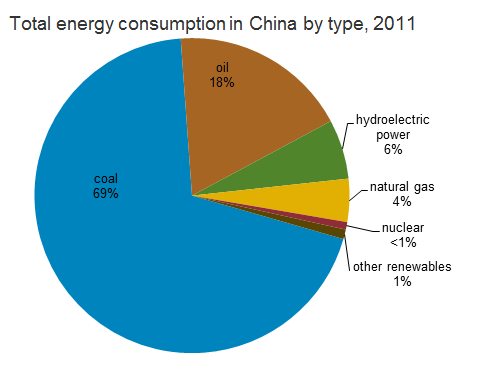 China's electricity generation continues to be dominated by fossil fuel sources, particularly coal. The Chinese government has made the expansion of natural gas-fired and renewable power plants as well as electricity transmission a priority. China had an estimated total installed electricity generating capacity of 797 gigawatts (GW) in 2008, and in 2009, net generation was 3,446 billion kilowatt-hours (Bkwh), 81 percent of which came from conventional thermal sources, mostly coal. Installed capacity increased over 10 percent between 2007 and 2008 and is expected to grow in the next decade to meet rising demand particularly from demand centers in the East and South of the country. FACTS Global Energy expects installed capacity will be over 1,000 GW by the end of 2011 and 1,600 GW by 2020. 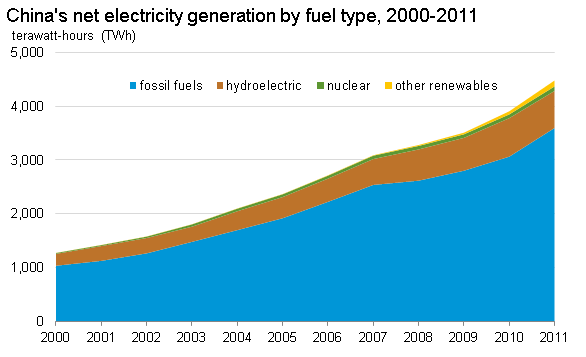 Both electricity generation and consumption have increased by over 110 percent since 2000. 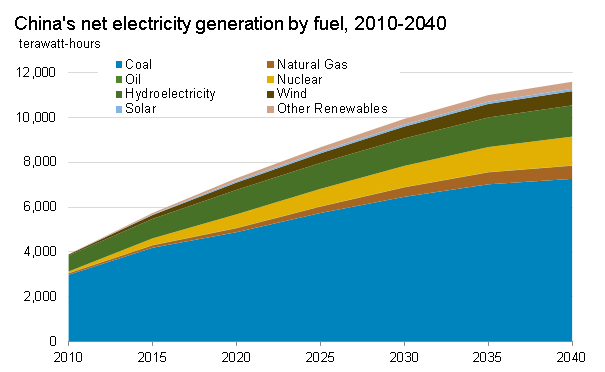 EIA predicts total net generation to increase to 10,555 Bkwh by 2035, over 3 times the amount in 2009. Rapid growth in electricity demand this previous decade spurred significant amounts of investment in new power stations. Although much of the new investment was earmarked to alleviate electricity supply shortages, the economic crisis of late 2008 resulted in a lower demand for electricity. Some industry analysts forecast the possibility of oversupply as an assortment of new projects are scheduled to come online in the next few years, though power demand is already rebounding as the Chinese economy recovers. The government is investing in further development of the transmission network, integration of regional networks, and bringing on planned new generating capacity. Investment in the transmission grid was greater than that in the generation sector for the first time in 2008. In 2002, the Chinese government dismantled the monopoly State Power Corporation (SPC) into separate generation, transmission, and services units. Since the reform, China's electricity generation sector is dominated by five state-owned holding companies, namely China Huaneng Group, China Datang Group, China Huandian, Guodian Power, and China Power Investment. These five holding companies generate about half of China's electricity. Much of the remainder is generated by independent power producers (IPPs), often in partnership with the privately-listed arms of the state-owned companies. Deregulation and other reforms have opened the electricity sector to foreign investment, although this has so far been limited. During the 2002 reforms, SPC divested all of its electricity transmission and distribution assets into two new companies, the Southern Power Company and the State Power Grid Company. The government aims to merge SPC's 12 regional grids into three large power grid networks, namely a northern and northwestern grid operated by State Power Grid Company and a southern grid operated by the Southern Power Company by 2020. Also in 2002, the State Electricity Regulatory Commission (SERC) was established, which is responsible for the overall regulation of the electricity sector and improving investment and competition in order to alleviate power shortages. Wholesale and retail electricity prices are determined and capped by the NDRC. The NDRC also determines a plan price that coal companies should sell to power producers for a certain level of supplies. Typically, generators negotiate directly with coal companies for long-term contracts. The NDRC made small changes to its pricing system, and in 2009, the agency allowed electricity producers and wholesale end-users such as industrial consumers to negotiate with each other directly. Also, China raised end-user prices for all sectors except the residential sector by $0.04/kwh in late 2009. The latest power tariff changes were from June 2010 when the government raised rates for energy intensive industries by 50 to 100 percent in order to achieve energy efficiency goals for the year. Conventional thermal sources currently make up about 81 percent of power generation and over 77 percent of installed capacity. Hydrocarbons are expected to remain the dominant fuel in the power sector in the coming years, primarily coal and natural gas. In 2009, China generated about 2,803 Bkwh from fossil fuel sources. The Chinese government envisages thermal installed capacity will reach 1,000 GW by 2020, up from 652 GW in 2009, representing about two-thirds of the total capacity. 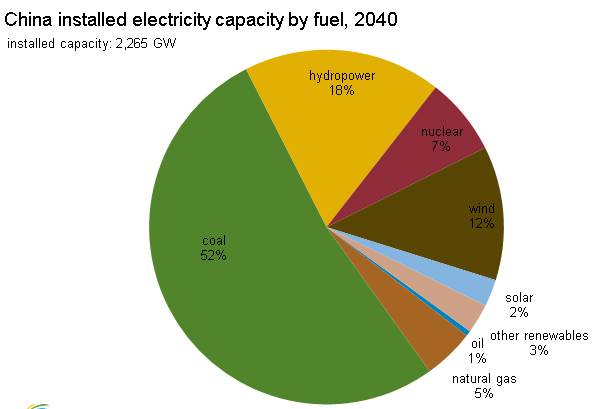 EIA predicts a more conservative growth for capacity, reaching 812 GW by 2020 and 1,300 GW by 2035. Because of the large amount of reserves, coal will continue to dominate the fuel feedstock for the power capacity and generation, even as other cleaner fuels increase market share. As with coal mining, the Chinese government is looking to shut down or modernize many small and inefficient power plants in favor of medium-sized (300 to 600 MW) and large (1000 MW and higher) units. The NEA announced that the government had met its annual target to remove 10 GW of coal-fired generation from small capacity generators in 2010 and that over 70 GW had been retired overall from 2006 to 2010. In following this trend, the NEA forecasts another 8 GW of coal generation will be removed in 2011. Natural gas currently plays a small role in the power generation mix (currently 5 percent of installed capacity and 2 percent in net generation); however, the government plans to invest in more gas-fired power plants as a growing marginal fuel source. Gas prices declined in 2010, and China is able to source the fuel from growing domestic sources as well as growing import alternatives, though coal still remains the less expensive feedstock. There are several examples of China's effort to bring new efficient gas-fired units online, some in conjunction with new LNG terminals such as those in the Guangdong and Shanghai. Also, there are several coal-fired and oil-fired power plants that are being converted to run on natural gas in Guangdong. In May 2010, Huaneng Power International, China's largest listed electricity generation company, signed strategic agreements with CNOOC to explore opportunities for gas-fired power projects in the coastal areas near re-gasification terminals. China has a goal to generate at least 15 percent of total energy output by 2020 using renewable energy sources as the government aims to shift to a less-resource intense economy. According to the consultancy EC Harris, in 2010, China is the world's top investor in renewable energy projects, having invested around $120 billion to $160 billion between 2007 and 2010. The Three Gorges Dam hydroelectric facility, the largest hydroelectric project in the world, started operations in 2003 and is slated to be fully complete by 2012. China was the world's largest producer of hydroelectric power in 2009, generating 549 Bkwh of electricity from hydroelectric sources. This represented 16 percent of its total generation. Installed hydroelectric generating capacity was around 197 GW in 2009, according to FACTS Global Energy, accounting for over a fifth of total installed capacity. The State Energy Bureau announced plans to increase hydro capacity to 380 GW by 2020. The largest power project near completion is the Three Gorges Dam along the Yangtze River, which will include 32 separate 700-MW generators, for a total of 22.5 GW. The Three Gorges project already has several units in operation, but the project is not expected to be fully completed until 2012. When fully completed, it will be the largest hydroelectric dam in the world. Wind is the second leading renewable source for power generation, and China is the world's fifth largest wind producer, generating 25 Bkwh in 2009, growing 100 percent from 2008. China's installed wind capacity in 2010 was 16 GW, and has roughly doubled capacity each year since 2005. However, the lack of transmission infrastructure in this sector has left a significant amount of capacity underutilized. The NDRC aims to increase wind capacity to 100 GW by 2020. China is actively promoting nuclear power as a clean and efficient source of electricity generation. Although China's nuclear capacity of 10.8 GW makes up only a small fraction of the installed generating capacity, many of the major developments taking place in the Chinese electricity sector involve nuclear power. China's government forecasts that over 70 GW will be added by 2020. As of 2011, China had 13 operating reactors and 27 reactors under construction. Following the Fukushima Daiichi accident in March 2011, China reported it was suspending government approvals for new nuclear plants until safety reviews were performed on current plants and those under construction. Many industry analysts do not see this incident significantly affecting China's investment in new reactors.